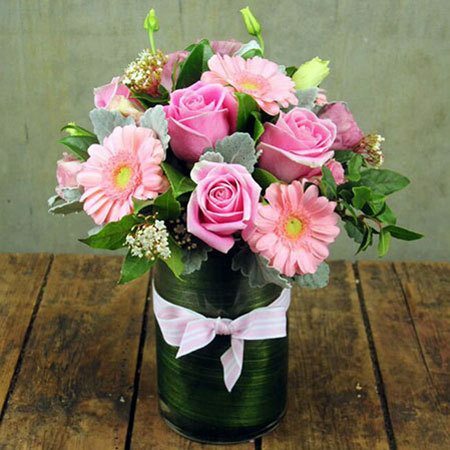 A pretty, girly-girl flower arrangement of pink garden roses, pastel gerbera daisies and romantic seasonal blooms such as lisianthus, artfully mixed with silvery foliage and fresh greenery, placed with love into a leaf-lined vase, and finished with a soft pink bow. Guaranteed to bring pink to the cheeks of the recipient to match their flowers! Ideal to celebrate the birth of a newborn baby girl, a birthday or anniversary, or even simply as a romantic gesture, congratulations or thank you. Order your gorgeous pink flowers online or via our toll free number 1800 66 66 46. 2016-06-01 Service rating : They were delivered when expected without issues and the greeting card was correct. Product : The recipient was very happy with the flowers, they were fresh and beautifully arranged, like the picture on the website. 2016-04-04 Service rating : Service and follow up emails citing delivery time very efficient. Great to be able to order over Easter period when most florists unavailable for early delivery following the weekend. Product : Arrangement was on the small side so value for money questionable. Very pretty though and looked reasonably fresh. 2015-10-29 Service rating : I`ve received flowers from your company which were ordered by my partner. Product : Ordered these on behalf of my boss for his daughter, no complaints whatsoever! Product : Flowers were very beautiful!! however were a touch smaller than I thought, it would be great to have a rough measurement of height on your arrangements description so that you can get a better idea of what you will be recieving.